On September 17, 2006, at the Breakfast of Champions at the New Atlantic Independent Booksellers Association trade show in Valley Forge, Pennsylvania, author Libba Bray received NAIBA's award for Best Young Adult Book of the publishing year for her novel REBEL ANGELS. Her acceptance speech, titled "Ode to Independent Booksellers," brought waves of applause and dozens of requests for copies. Bray, who worked at an independent bookstore as a teenager in Texas, has given me permission to reprint her speech here. Please forgive me for running two guest posts in a row; I wanted to share this wonderful speech while it is still fresh. They are a cup of black coffee, straight up no chaser, in a half-caf-vanilla-hazelnut-with-whipped cream kind of world. When you walk up to independent booksellers and say, with deepest apologies, “I’m looking for this new book about the Victorian era and I can’t remember the author’s name but it has Glass somewhere in the title,” they do not roll their eyes and send you to the purgatory of the information desk—that circle of hell not described by Dante. No, they smile and say, “Why, I think you’re looking for The Glass Books of the Dream Eaters by Gordon Dahlquist.” Because they know everything. Independents are the Iggy Pop of the book biz—on the edge, a little dangerous, cooler than you will ever think of being, and still alive despite the odds. 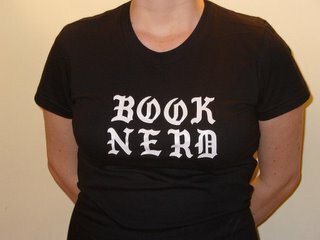 Instead of the t-shirts that trumpet, “I do my own stunts,” they wear the shirts that say, “I do my own thinking.” The badge that says, Hello My Name is Book Lover. The tattoo that reads, I Sell Banned Books—Ask Me How! They rip the gags off intellectual freedom and the silly bras off John Ashcroft’s statue of justice. Independent booksellers know not to put People Magazine and industrial-sized tubs of Swedish Fish right next to the counter because that is just lighting the crack pipe and handing it over. They are the ones who take aside disaffected, snarky seventeen-year-old girls from Texas, and even though that seventeen-year-old girl might be wearing a Devo-inspired, orange jumpsuit and heavy black eyeliner that she thinks makes her look like Chrissie Hynde but really just makes her look like she’s been on the losing end of a bar fight, they say nothing but steer her instead toward Douglas Adams and Thomas Pynchon, Zen and the Art of Motorcycle Maintenance and The Stranger, Woody Allen and Amiri Baraka. They are the openers of doors. The carnival barkers to exotic, new worlds. The Book Whisperers. They are charming dinner companions, and they always bring good wine. Being around independent booksellers makes you feel smarter by association. They do not want an author’s soul to be remaindered. It is not easy to be an independent these days. It is an age of twenty-four-hour sound bites, of product and packaging and a thank-you-drive-through-please marketplace, of “truthiness” and cynicism masquerading as patriotism, of lies and betrayals that challenge the ability to stand fast in independence. As we sit here in Valley Forge, staring across the glittering forever highways of America to the historic land just beyond, it is a stirring reminder that this was a nation founded by independents. And it feels no less a radical, necessary act to me today to be a champion of books—to champion ideas, to explore the myriad complications of the human heart, to examine the individual not out of context but as part of the larger human story. We have never needed the independent spirit more than we do right now. It is necessary work, and I humbly thank you for it.